The New York Mets have reached a five-year, $137.5 million extension with ace Jacob deGrom, according to multiple reports. The deal will carry an average annual value of $27.5 million and has an opt-out after the 2022 season, according to Ken Rosenthal of The Athletic. 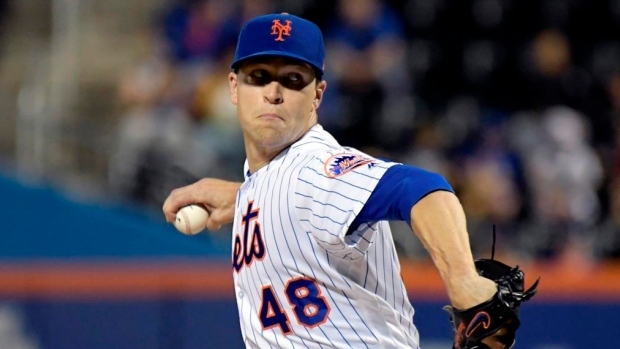 DeGrom five-year, $137.5M deal with #Mets includes full no-trade clause, sources tell The Athletic. Gets opt-out after ‘22, same as Sale, even though he is a year further from free agency. Will earn $107M between now and opt-out, Sale, $105M. The deal comes just days after fellow Mets pitcher Noah Syndergaard called on the organization to sign the reigning NL Cy Young Award winner to an extension. "I think Jake's the best pitcher in baseball right now," Syndergaard said Sunday. "I think he deserves whatever amount he's worth. I want to keep him happy so when it does come time for him to reach free agency he stays on our side pitching for the Mets. "I think they should just quit all this fuss and pay the man already." DeGrom went 10-9 with a sparkling 1.70 ERA in 32 starts last year. Aces Chris Sale and Justin Verlander and sluggers Mike Trout and Paul Goldschmidt recently finalized new contracts. Syndergaard, 26, said failing to do the same with deGrom could send a message. "I think so, yes, because of what you see going on in baseball right now," he said. "I feel like if there wasn't a trend of other guys getting contract extensions, I don't know what the circumstance would be. "You see those guys getting extensions, I think it's time Jacob gets one, too. He's really good, a great teammate. I don't get it." A ninth-round pick of the Mets in 2010, deGrom has been pitching with the MLB club since 2014, posting a 55-41 record with a 2.67 ERA and a 1.072 WHIP. He was named Rookie of the Year in 2014 and has attended two All-Star games.